Silence. The silence of God. How do you cope with that? 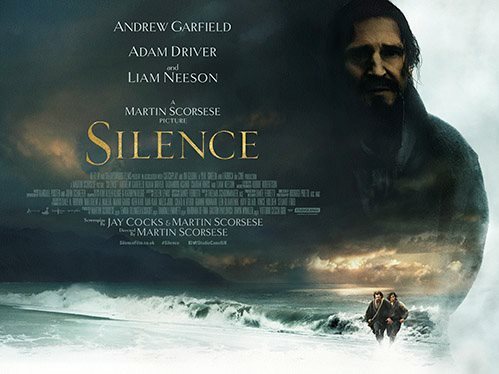 Jesuit priests, Sebastião Rodrigues (Andrew Garfield) and Francisco Garupe (Adam Driver) set out for Japan on search of their lost mentor, Father Cristóvão Ferreira (Liam Neeson). The last news of him suggested that he had renounced the Catholic faith and gone native, embracing Buddhism and a Japanese a wife. Surely not, think his acolytes. Unthinkable. And off they go. Wasn't easy being a Catholic in seventeenth century Japan. The authorities viciously persecuted missionary priests and their Japanese converts. They were doused with boiling water, burned alive, drowned. This is all shown in wince-inducing detail. But nothing could induce Ferreira to renounce his faith. Right? We'll see. The film is beautifully shot, with the glories of nature standing in contrast to the ugliness of human cruelty. The pace is slow moving and meditative. The main 'priest' parts are played well, as are the Japanese characters. Rodrigues has his own serial Judas in Kichijiro; too cowardly to stick to his beliefs, yet racked with guilt over his frequent lapses from faith. The Inquisitor not a is not portrayed as stereotypical sadist 'baddie'. He seems almost kindly on occasion, visibly deflating when Rodrigues refuses to yield. But he will stop at nothing to stamp out the alien faith, using physical and psychological torture to achieve his aims. The film explores some thought-provoking themes. When Garupe expresses disappointment with their flock of devout peasant villagers, Rodrigues reminds him, "Christ did not die for the good and beautiful. It is easy enough to die for the good and beautiful; the hard thing is to die for the miserable and corrupt." In his suffering Rodrigues becomes increasingly identified with Christ. Before his arrest by the Japanese authorities, having been betrayed by Kichijiro, the priest stoops to drink from a stream. His face reflected in the water suddenly becomes that of Christ's. Paul wrote of the 'fellowship of Christ's sufferings' (Philippians 3:10). The Inquisitor explains to Rodrigues that Christianity will never take root in Japanese soil. It is a Buddhist country. What might be true for Europeans won't work in Japan. The priest counters that according to the Christian faith, truth is the same everywhere, or it's not truth at all. When Rodrigues finally encounters his mentor, Ferreira, his worst fears are realised. The Jesuit missionary had lapsed from the 'true faith' and conformed to Buddhism. How could he? How could anyone? The renegade priest explains that Japanese believers who had turned their back on Roman Catholicism under the pressure of persecution had not really understood it. Under the influence of Buddhism the Japanese could not conceive of any reality beyond nature. Christianity had not been properly contextualised so that indigenous people could grasp the Creator/creature distinction. When they heard of the Son of God, they identified him not as the second person of the Trinity, but as the sun that shines in the sky. But a sense of the transcendent beyond nature is not that easy to eradicate. According to Paul, even idolatrous pagans know God, even though they would prefer not to, Romans 1:20-21. The Christianity under the spotlight in the film is decidedly Roman Catholic, replete with religious icons, symbols, masses and priestly absolution. Iconoclastic Protestants would not have had qualms over treading an image of Christ into the dirt as Roman Catholic believers are forced to do in the film. So what? But if such an act was seen as a repudiation of faith in Christ, that would be more tricky. One of the main things that hit home to me in watching the film was the great evil of religious persecution. No one should be forced to abandon their beliefs. The Inquisitor concocted a cruel dilemma for Rodrigues. Only if he denied his faith would his friends be spared untold suffering. Now he understands why Ferreira had gone native. The priest turned Buddhist suggests to the younger man that his apostasy would be an act of love; laying down his faith for his friends. What Rodrigues wrestles with throughout his trials is the silence of God in the face of such wretchedness. It's nothing less than tragic that people are still persecuted for their faith in the 21st century. Organisations such as Open Doors campaign for an end of religious persecution and seek to channel aid to suffering believers. The final scene reveals whether Rodrigues had indeed lost his Roman Catholic faith as the heavens remained silent. When facing death, what did he have left to hold on to? The silence has been shattered. The Cross is the grand announcement of God's love. Jesus suffered with us and for us that we may be rescued from sin and suffering though faith in him. He endured the awful silence of God, crying from the Cross, "My God, my God, why have you forsaken me?" He did not die for the good and beautiful, but for the miserable and corrupt. Those who share in his suffering will also share in his glory.